This new Digital Impact Alliance (DIAL) and Flowminder white paper lays out specific examples of how FlowKit has the potential of becoming a key solution to improve the efficiency and effectiveness of disaster and emergency response. The Digital Impact Alliance (DIAL) and Flowminder today released a white paper focused on FlowKit and its ability to unlock the power of mobile data for humanitarian and development purposes. The paper was developed by Flowminder with support from DIAL and GSMA and comes on the sidelines of the Mobile World Congress, which is taking place in Barcelona this week. It follows the organizations’ FlowKit announcement last fall. FlowKit promises to make routine what is currently a specialized practice—using secure data produced by mobile network operators (MNOs) to inform public health, government service delivery and crisis response, among other humanitarian and development needs. It provides humanitarian and development actors with an analytical toolkit developed specifically for their use cases, informed by Flowminder’s experience working in this area. FlowKit facilitates collaboration between MNOs and humanitarian and development organizations by breaking down barriers and lowering overhead costs, making it easier for all partners to reap the benefits of forming partnerships. FlowKit provides the technical support and guidance organizations need to install and implement it. Organizations can also install, utilize and customize FlowKit on their own if they have the capacity. It allows for the secure and compliant access of mobile data behind an MNO’s firewall, which helps surmount one of the biggest obstacles to forming partnerships between MNOs and humanitarian and development organizations. In addition, FlowKit includes data quality assurance tools, creating further efficiency gains for analysts. It is an open source, community-focused software project. All of its documentation, processes and code are openly accessible and available, promoting greater confidence among all stakeholders. As an open source project, FlowKit will continue to evolve as techniques and learnings derived from research are incorporated back into the core tools. 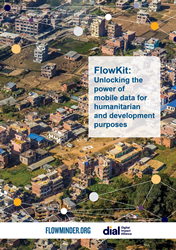 The paper, “Flowkit: Unlocking the Power of Mobile Data for Humanitarian and Development Purposes,” details examples of how the tool can assist humanitarian and development actors to improve decision-making and achieve impact. Readers will find use cases and other information relevant to their own applications. To explore the toolkit, visit: https://flowminder.github.io/FlowKit/. To read the paper, go to: http://bit.ly/DIALFM. Flowminder provides insights, tools and capacity strengthening to governments, international agencies and NGOs. Flowminder is a non-profit organisation composed of practitioners and academics from development, public health and humanitarian sectors. The mission of the organisation is to develop and operationalise new methods and data sources to support decision-makers, improve operational efficiency and deliver services in low- and middle-income countries. Working closely with researchers at University of Southampton UK and elsewhere, Flowminder develops new methods and data to understand the distributions, characteristics and dynamics of human populations, and provides support for decision-makers to leverage the operational opportunities of radically improved sociodemographic data. The Digital Impact Alliance (DIAL) aims to realize a more inclusive digital society in emerging markets, in which all women, men and children benefit from life-enhancing, mobile-based digital services. A partnership among USAID, the Bill & Melinda Gates Foundation, the Swedish government and the United Nations Foundation, DIAL’s efforts help accelerate the collective efforts of government, industry and development organizations to realize this vision.